Can Tapping Into Your Memory Help You Stay Aerobically Fit? November is Alzheimer’s awareness month. There are fun ways to teach your loved ones effective exercise and lively movement to improve their cardio and strength endurance—two activities that assist in brain health. 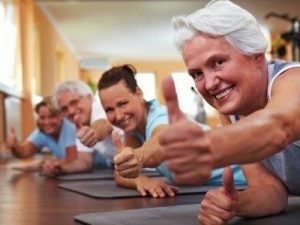 There is no shortage of research regarding the benefits of regular exercise on brain health in both cognitive and cognitively impaired (Alzheimer’s or dementia) individuals. What I haven’t seen is what the researchers say are the best ways to communicate instruction to those who have lost their executive function and cannot follow directions easily. Executive function is usually affected by age, particularly when it is necessary to multitask. It is an umbrella term for a range of cognitive processes, including memory, problem-solving, processing speed, mental flexibility and other tasks. When switching from one task to another, the elderly have more difficulty paying attention to multiple lanes of traffic, or noticing if someone is about to step off a curb at a busy intersection. * Processing information rapidly and dividing attention effectively are cognitive skills that peak in young adulthood. To be able to recall an event or new information, the brain must register the information, store it, and then retrieve it when needed. The ability to recall new information, such as reading material, peaks early and gradually becomes more challenging after age 40. Studies show that by age 70 the amount of information recalled 30 minutes after hearing a story once is about 75 percent of the amount remembered by an 18-year-old. Recognizing exercises from the past, such as marching (aerobic exercise), might come easier with music, but for those who do not recognize a new task, such as stepping side to side to improve their hips and gluteal muscles, may not be. Music that stimulates old memories along with hands-on cues provide kinestic awareness that can help the individual get through the task. It is easier than remembering it without any cues, and th is ability can make the difference between getting a good workout and not. Kinestic awareness refers to how our senses take information from our brain and translate that data into movement. I use touch and closed-eye patterns as sensory tools when I see my clients get stuck in inefficient movement patterns or have trouble following instructions. Lori Michiel Fitness trainers are educated in recognizing and correcting these inefficient actions. Follow my YouTube videos for some fresh ideas that offer other types of safe interval training to delay the disease. We offer private training, including stretch sessions, program design and more. Visit our website at www.lorimichielfitness.com, join us on Facebook or contact us via email or call 818-620-1442. We see fitness differently! PsychCorp. Wechsler Memory Scale-Fourth Edition (WMS-IV) Technical and Interpretative Manual. San Antonio, TX, Pearson, 2009.